Page Updated:- Saturday, 23 March, 2019. Deal/Walmer area c.1906. 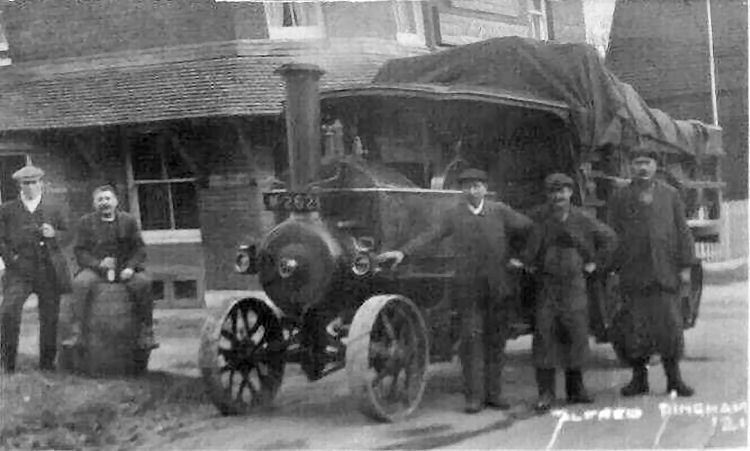 The steam lorry is delivering Thompson's beers to a pub, presumably a tied house, somewhere in their trading area. Er... that's about it from me! I'm not as familiar with the Deal area pubs as I am with those nearer Canterbury. However, I'm sure one of your contacts will recognise this pub. Over to you/them then! Another as yet unknown one from Rory Kehoe. Steve Glover says the following:- I think that looks rather like the original building of the "Five Ringers" in Upper deal. With the hangy over bit on the bottom of the building... otherwise not much to go on. If that was 1906 ——, as it says, then it burnt down soon afterwards,(as things do around here) and was re-built. Michael Mirams points out that this is in fact the "Palm Tree" at Eythorne, that closed in 1964.